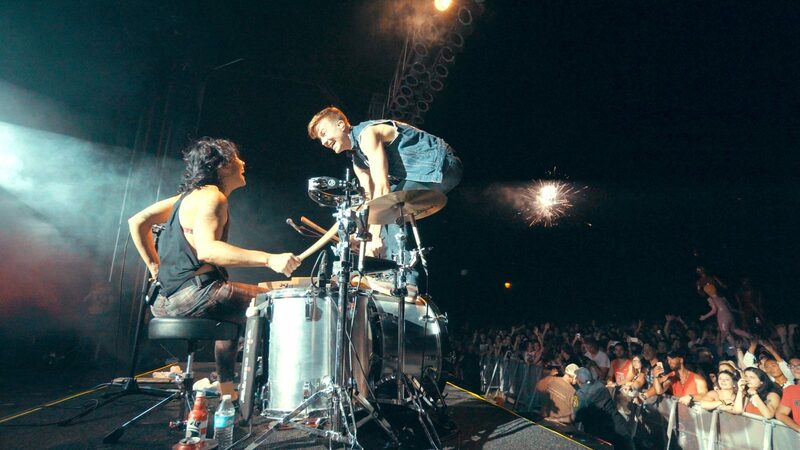 Fans of fun-loving indie pop-dance outfit Matt and Kim have had to wait a few years for a new headlining tour from the New York City duo. But patience is a virtue, and all the waiting will grind to a halt for Twin Cities concertgoers when a reinvigorated Matt Johnson and a healed Kim Schifino take the stage in First Avenue’s Mainroom on April 16, 2018. 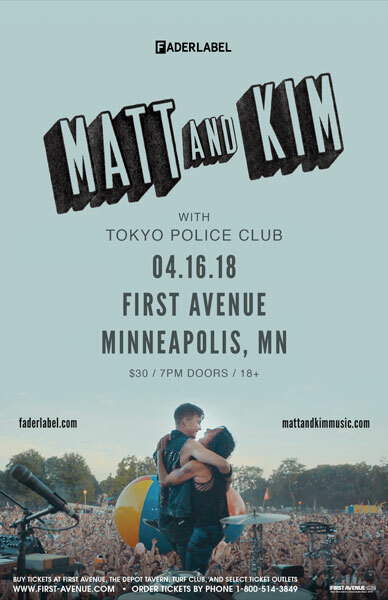 Supported by indie rock group Tokyo Police Club, Matt and Kim will introduce a sold-out crowd to Almost Everyday, their latest LP from FADER Label, which drops in May. Now with six studio albums to pull from, the pair, known for their raw energy and beat-driven singalong dance tracks, will unload an arsenal of new music on Minneapolis. “Being that we haven’t done our own headlining tour in like three years now, I’m very excited to just be in a room full of people who know so many of the songs,” Johnson said. There may be a new slant to their forthcoming album, and they may have been on hiatus for a year, but make no mistake: they’re still the same Matt and Kim. Johnson’s vocals and keys remain dynamic and on point, and Schifino is still as bold and engaging as ever, willing to dance by the Tower Bridge in London and give Animal of the Muppets a run for his money on the drumsticks. Johnson expanded on the beats and themes that come through on Almost Everyday. “Generally, we’ve been lucky enough to have this really great life, and we write songs that are inspired by more upbeat things. And this was different—it was helpful to make the album,” Johnson told me. “The inspiration comes in deep, and heavy, and fast. And you can work quicker because you’re not searching—it’s coming to you.” With the refined approach, the new album features several artists guesting, including Mark Hoppus from blink-182 and punk group SWMRS. Behind the inspiration for the guest spots, Johnson said he thought “it would be cool to hit up people that we’re friends with that play music and kind of give it the community aspect.” He stated, “Overall, what it does is just adds this extra layer of live feeling to it, but in the end, it was also really fun to have these musicians that I’m such a fan of sing on a song that we wrote.” Though attendees at First Avenue can’t expect to hear Hoppus or SWMRS live on Monday, they definitely can—and are encouraged to—sing and dance along with Matt and Kim.